The Walter Rodney Commission of Inquiry Report will finally be handed over to President David Granger next week, but already the Commission Chairman is signaling that there are likely to be gaps in the conclusion. Commission Chairman, Sir Richard Cheltenham told reporters that he would be presenting the report to the Guyanese leader on February 8, 2016. The report should have been presented on November 30, 2015. He explained that several of the terms of reference of the Commission were better supported in evidence than others which were affected by lack of or insufficient evidence. “The premature termination of the public hearings will mean, as I said earlier, the report will not be as thorough and it means, too, that insofar as there were some individuals who were critically commented on in the course of the evidence who did not get a chance to answer we will be very disinclined to make critical findings of fact in relation to those who were criticized but who did not get the opportunity to answer those criticisms,” he said. Attorney General, Basil Williams, who before the May 11, 2015 general elections was the lawyer for the People’s National Congress Reform, reiterated that “we don’t necessarily agree with Sir Richard that there was a premature end to the hearings.” After about two years, Williams said a lot of money has been spent on the Inquiry and it needs to come to an end. Estimates are that more than GYD$400 million have been already spent on the inquiry. 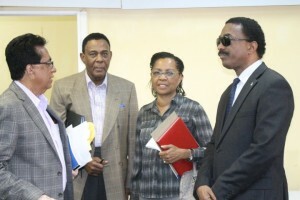 A pressure group, Friends of Walter Rodney, failed in its petition to persuade the President to reopen the inquiry to allow for key witnesses including former Head of the Criminal Investigations Department of the Guyana Police Force, Cecil ‘Skip’ Roberts to testify. Sir Richard and fellow commissioners– Trinidad-based Senior Counsel Seenath Jairam, Queens Counsel Jacqueline Samuels-Brown- are back in Guyana for the final phase of the “report writing phase.” “To the extent that we were writing in three jurisdictions, it is important that we meet and avoid overlapping and make sure that we have a smooth-running and coherent story at the end of the day,” he said. Back in February, 2014 then President, Donald Ramotar had ordered a Commission of Inquiry into the June 13, 1980 bomb-blast death of Dr. Walter Rodney, on John Street, near the Georgetown Prison. The Working People’s Alliance (WPA), the party that Rodney had co-founded, has always maintained that the then PNC regime led by Forbes Burnham was responsible for the assassination. At the time of Rodney’s death, he had been leading a civil rebellion to remove the Burnham-led administration by any means necessary. Then Guyana Defence Force (GDF) electronics expert, Sergeant Gregory Smith had given Walter’s brother, Donald, the device and had told him to test it near the metal wall of the Georgetown Prison. Shortly after the incident, Smith and his family went to French Guiana where he had lived and worked under the name of Cyril Johnson until his death about 10 years ago.